"We think of autism as a social disorder because children with this condition often struggle with social interactions, but what we sometimes neglect is that almost everything we know about the world comes from our senses. Abnormalities in how a person sees or hears can have a profound effect on social communication." Although previous studies have found that people with autism possess enhanced visual abilities with static images, this is the first research to discover a heightened perception of motion, the authors write. The findings were reported in the Journal of Neuroscience on May 8 by Tadin, co-lead author Jennifer Foss-Feig, a postdoctoral fellow at the Child Study Center at Yale University, and colleagues at Vanderbilt University. In the study, 20 children with autism and 26 typically developing children, ages 8 to 17, looked at brief video clips of moving black and white bars and simply indicated which direction the bars were heading, right or left. Each time a participant made the correct direction choice, the next video clip became slightly shorter and thus a little more difficult. When they made a mistake, the next video became a bit longer and thus easier to see. In this way, the researchers were able to measure how quickly children with autism can perceive motion. Your browser does not support the video tag. Download the video clip here. Example of low-contrast video clips showing motion in two different directions. The researchers found that when the bars in the image were just barely visible, both groups of children performed identically. When the contrast or darkness of the bars was increased all participants in the study got better at perceiving the direction of movement. "But kids with autism, got much, much better�performing twice as well as their peers," says Foss-Feig. In fact, the worst performing participant with autism was roughly equal to the average of the participants without autism. Example of high-contrast video clips showing motion in two different directions. "This dramatically enhanced ability to perceive motion is a hint that the brains of individuals with autism keep responding more and more as intensity increases. Although this could be considered advantageous, in most circumstances if the neural response doesn't stop at the right level it could lead to sensory overload," explains Foss-Feig. Children with autism demonstrated much faster reaction times when detecting motion in high-contrast objects than their peers without autism. Such hypersensitive perception is the neural signature for a brain that is unable to dampen its response to sensory information, note the authors. This same increase in neural "excitability" is also found in epilepsy, which is strongly linked to autism. In fact, as many as one third of individuals with autism also have epilepsy. Normally, the brain puts the brakes on its responses to sound, taste, touch, and other stimuli when they become too intense. What's important about this dampening ability is that it's a ubiquitous mechanism controlling how humans perceive the world. "If the processing of our vision, hearing, and other sensory systems is abnormal in some way, it will have a cascading effect on other brain functions," says Carissa Cascio, assistant professor of psychiatry at Vanderbilt University, in whose lab the study was conducted. "You may be able to see better, but at some point the brain really is over responding. A strong response to high intensity stimuli in autism could be one reason for withdrawal." 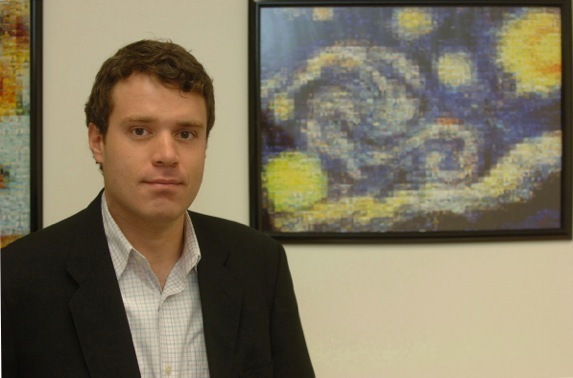 The research builds on earlier findings that people with autism process visual stimuli differently. For example, previous studies have shown that individuals with autism are better able to perceive basic patterns, are able to see simple line images more quickly, and are more focused on details than individuals without the condition. By contrast, in more complex tasks, like facial recognition, these enhancements become impairments. 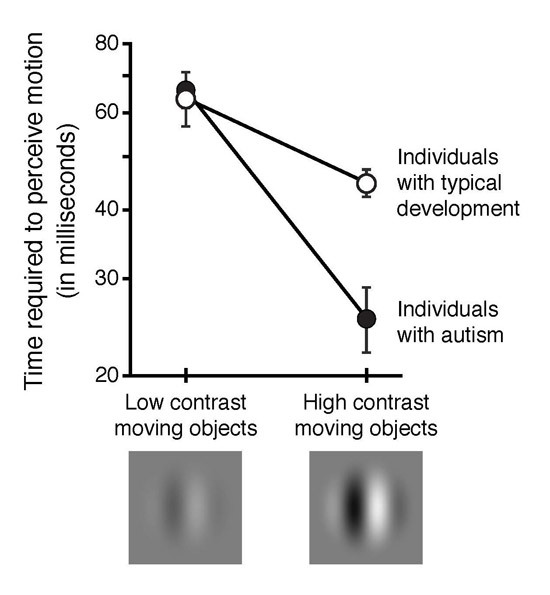 Likewise, autism is associated with deficits in perceiving motion patterns more complex than the simple moving bars used in this study, such as detecting walking and other biological movements. Kimberly Schauder, a research assistant at Vanderbilt University, is also an author on the paper. The research was supported by grants from the National Institutes of Health.